Down syndrome is a form of inborn disorder caused by the abnormality of chromosome 21, most commonly having an extra chromosome on chromosome 21 (Trisomy 21). An infant with Down Syndrome has unique facial characteristics and almost all infants with Down Syndrome will also possess an intellectual disability. Nearly half of Down infants with Down Syndrome have physical abnormalities such as heart disease. Currently, there is no cure for Down Syndrome. 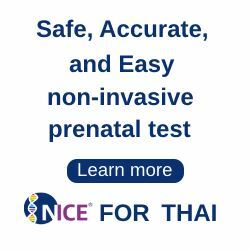 The NICE test is a safe, accurate and easy non-invasive prenatal test that detect trisomy 21 (Down Syndrome), trisomy 18 (Edwad Syndome) trisomy 13 (Patau’s Syndrome) in maternal blood. Using Cell-free DNA and massive parallel sequencing technology, NICE test can provide as early as 10 week’s gestation and most efficient prenatal screening test with less than 0.1% of false positive. For more information, please contact +66(02) 1066999 or request a NICE appointment today.